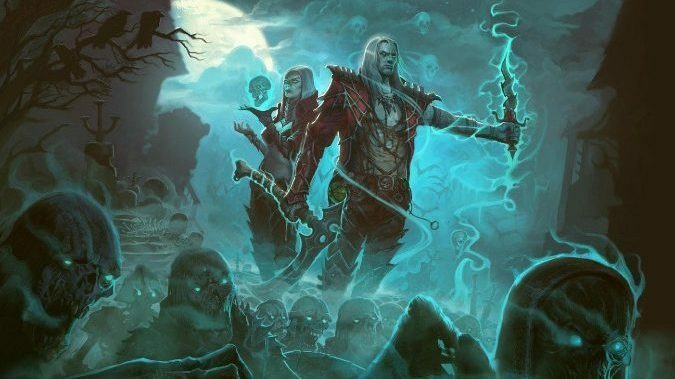 Blizzard is hard at work developing the next Diablo 3 class, the Necromancer, announced at BlizzCon 2016. Still on target to roll out in a content pack in “the second half of 2017”, this ranged damage dealing class has a more active pet than the Witch Doctor and some support spells that can heal his or her teammates. Today the Diablo team showed off some of the kit they have in the works for the class starting off with Grim Scythe, a spectral weapon attack that damages enemies in a wide arc and replenishes the Necromancer’s main resource, Essence. Another new skill, Leech, damages enemies and turns it into health for himself and his teammates. And three skill runes: Death Rune, an AOE that requires both Essence and health to cast , Cannibalize which restores health by devouring corpses, and Blood Golem who will not only attack foes, but sacrifice himself (itself?) to heal the Necromancer. The team also wanted to show off the finished art for the female Necromancer form. There are no confirmed dates yet on when the class will show up on the PTR or launch on the live servers. It will be released as part of the Rise of the Necromancer DLC which includes a new in-game pet, two new character slots, two new stash tabs, a portrait frame, pennant, banner, and banner sigil. No word yet on the price of the DLC, but a free content patch will also launch at the same time with new zones, Challenge Rifts and more. For more information about the Necromancer, check out our hands-on impression from the demo stations at BlizzCon last year.